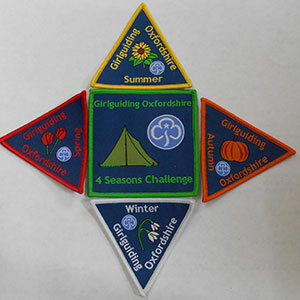 Girlguiding Oxfordshire has a 4 Seasons Challenge scheme. If you spend a night under canvas or the stars, in the relevant season, on a recognised Girlguiding camp get the card signed by a leader/adult who also attended the event. You can only earn one triangle/season badge per event, where an event crosses over two seasons you choose which badge you would like it to go towards. Record cards and order forms are available in the Members Area.